Just two years ago we wrote, in worry, about “The dry Dry Season”, the extended drought that we were experiencing. Our concern then was about the bush fires becoming forest fires and destroying our forests. And today, when we should be over a month into the dry season, we are experiencing regular and sometimes heavy rainfall. Is the weather confused? Or is it just confusing us who probably notice it more than we adapt to it. We are seeing subtle changes in the flowering and fruiting of some of our forest trees. While we are accustomed to seeing the flaming Immortelle flowering at this time, there are some Chaconia blooming as well, and this should not happen until around July. But we can feel the Dry Season pushing through! The strong northeasterly breezes, the spanking blue sky between the sudden showers, and the fact that the trails underfoot are becoming drier makes this transition period an especially beautiful time to be at Asa Wright. The forests are cooler, the birds are brighter, and seem to sing more stridently, and the rivers and streams are full, and go crashing down through the valley. It’s a beautiful time to be here with us, so, are you on your way? At this time of the year great swaths of our forests are turning brilliant vermillion! 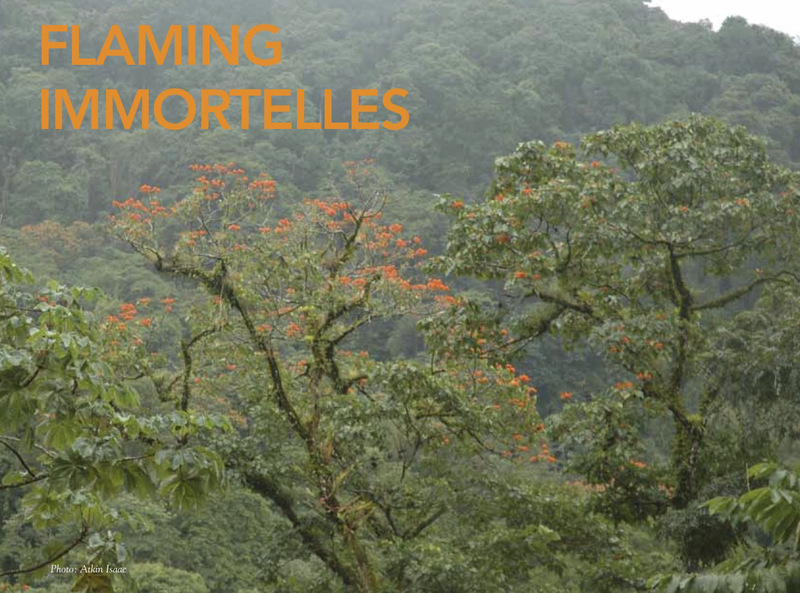 This is because the Immortelle trees (Erythrina poeppigiana) are flowering. These are large trees; they grow to a height of about 80 feet (25 metres), and begin to flower at the end of the rainy season, late December, each year. Known mostly to the layman for its beauty when flowering, the Immortelle is also called “the Flame Tree”, for obvious reasons. 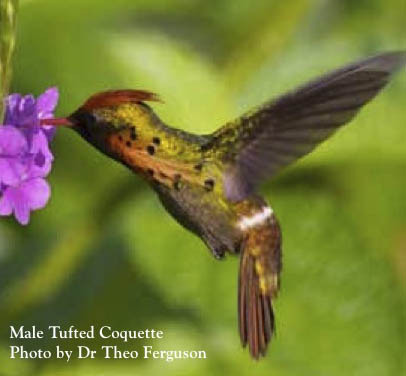 But as lovely as is the spectacle of the flaming immortelles in the hills around the Centre, there is a slight downside to their presence: many of our humming birds, especially the White-Necked Jacobin, leave the precincts of our verandah to fly up into the vermillion canopies to enjoy the nectar of those flowers! While birds of turquoise plumage roam the hills at Asa Wright Nature Centre, flowers of a similar hue welcome our visitors. Named after its spectacular blue-green colour, the Jade Vine (Strongylodon macrobotrys) is a native of the tropical rainforest of the Philippines but a current inhabitant of the Jade Vine Arbor at Spring Hill. This liana produces hanging inflorescences of a colour that is seldom found in flowers. In the wild, the Jade Vine is normally pollinated by bats which will hang upside down to drink the nectar from its claw-shaped flowers. The Jade Vine has been threatened by continuous deforestation of its natural habitat in the Philippines. 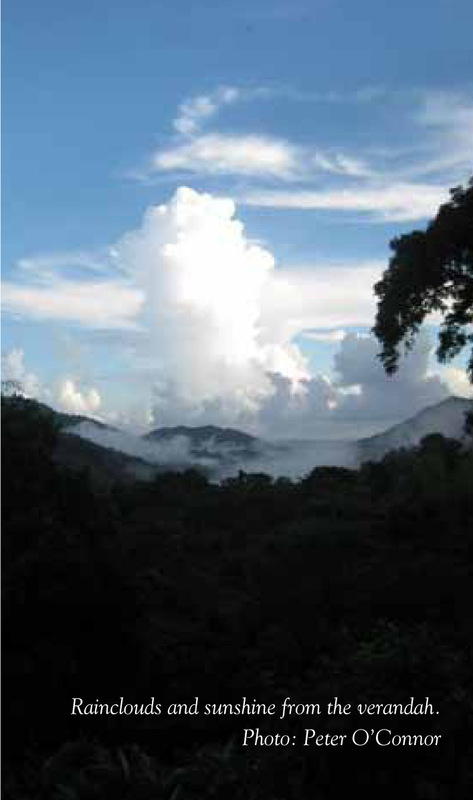 One study says that between 1990 and 2005, 32.3% of forest cover was lost in the Philippines. The Jade Vine was recently described by a popular website, Listverse.com, as one of the top ten incredibly rare flowers in the world. It has been a long time since we have seen an ocelot (Leopardus pardalis) or “tiger cat” at Spring Hill. But before you get excited, we have not sighted one, at least, not yet. 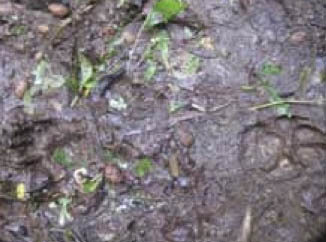 However, we did spot the footprints of what appeared to be a large ocelot along the Bamboo Valley Trail on Thursday 27th October. Field workers had cutlassed and raked the trail, in the vicinity of the old hydro generator, at around 1pm. But a walker on the trail at about 4.30pm spotted clean paw-prints on the trail, which means the cat passed there in the early afternoon. It had come down the eastern slope of the Bamboo Valley Trail, passed the old generator, crossed the bridge at the lower pool and started up the western slope of the trail before the tracks were lost. The ocelot walked at least one hundred metres along the trail, within a couple of hours of it being cleared. Hopefully, it will soon be recorded as a live sighting! The Green Honeycreeper is common but far from ordinary. Numerous at the feeders at the Asa Wright Nature Centre and found from southern Mexico to Brazil, the Green Honeycreeper echoes the beauty of a turquoise sea. Its beauty is no surprise since it belongs to the Tanager (Thraupidae) family which boasts some of the most gorgeous small birds in the world. 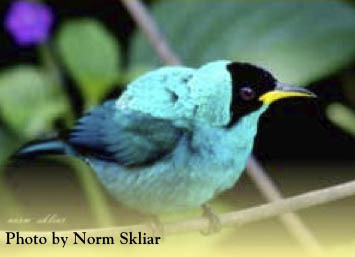 The male Green Honeycreeper has turquoise plumage and appears to wear a black mask while the female has grass green coloured plumage. A main characteristic of this species is the sharp, slightly decurved bill. Both have yellow on the lower part of the beak, the male’s beak being brighter yellow than that of the female. This bird measures 5.5 inches and makes high- pitched “chips”. The song however is not distinctive. It is as though this bird doesn’t need much sound as it can rely on its dazzling feathers to garner attention from other animals. This certainly serves to attract humans. As the name Honeycreeper suggests, this bird has a sweet tooth, er, beak. It eats fruit, sips nectar and less often, forages for insects. It particularly likes the berries of Miconia spp. and Trema micrantha. Green Honeycreepers are forest-dwellers and are most common in humid forests at low to middle elevations. They often frequent the canopy of the forest. This Tanager breeds from May to July and lays a clutch of two eggs. 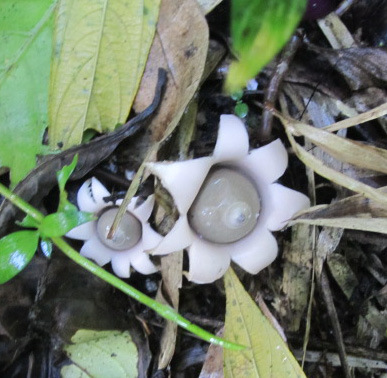 Eggs are white with a circle of brown spots at the wider end. 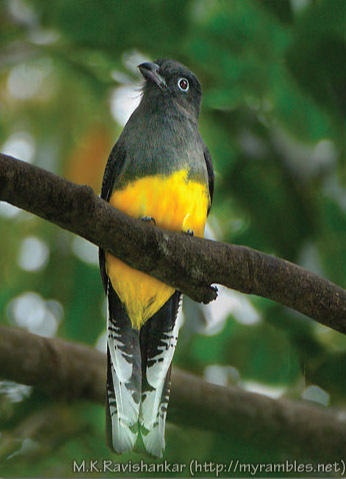 This bird can be found in small groups mostly made of other Tanagers and Honeycreepers. Come to the Asa Wright Nature Centre and let the Green Honeycreeper awaken your sense of wonder. We had not seen a deer at Spring Hill for years. 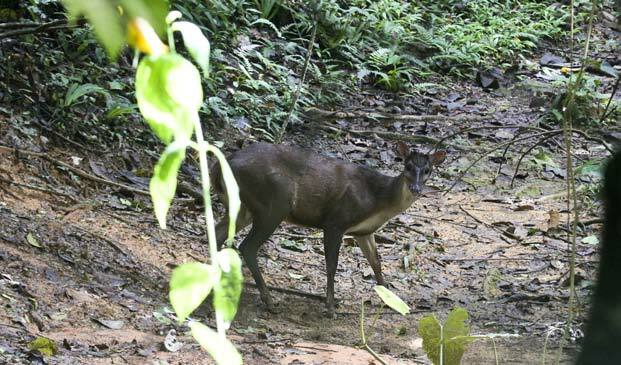 But in late June, while Head Guide Mukesh Ramdass was with Vic and Andrea Thomas on the Chaconia Trail, trying to photograph a Common Potoo at about 1.30 pm, they suddenly saw a full grown Red Brocket Deer quietly standing in the middle of the trail! The deer, we presume it was the same one, was also spotted one night at about 7.30 pm crossing the driveway. We hope this deer is the first of many. were not harvested for the kitchen! And finally, and this too is wonderful news, Pawi Birds (Piping Guans) were seen by a group out on tour at the top of our mountain. The Piping Guan has not been seen this close to us for years, but we have no photos of this sighting. The Piping Guan, or Pawi, is only found in Trinidad’s Northern Range, and this endemic bird is under threat. So, when the Board of Trustees closed their AGM, they were taken from Spring Hill to Grande Riviere, in the hope of seeing a Pawi. A late Saturday afternoon trip by maxi had the group arriving in Grande Riviere just in time for dinner at Asa Wright’s partner resort, Le Grand Almandier. Wake-up call was 4.00 am on Sunday, for the hike to the Pawi was starting at five. The road up the Valley from Grande Riviere village has been paved recently, and this made the walk into the forest an easy one. No Pawi were seen on the walk to the end of the road, but all were rewarded on the way back, when, getting close to the village, they saw a beautiful Pawi sitting in a nutmeg tree quite close to the road. Mission accomplished, it was back to breakfast and the long drive to Spring Hill. From there, our Board members headed back to their countries, with the memory of Divali and the Pawi.